Things that make me go SQUEEEE include new books from my favorite authors, seeing new book covers from my favorite authors and reading book blurbs from my favorite authors. And this weekened, Leila Sales gave me ALL 3! SQUEEEEEEEEEEEEEEEE! PAST PERFECT her second novel will be released October 14, 2011. LOOK! Check out the cover! All Chelsea wants to do this summer is hang out with her best friend, hone her talents as an ice cream connoisseur, and finally get over Ezra, the boy who broke her heart. But when Chelsea shows up for her summer job at Essex Historical Colonial Village (yes, really), it turns out Ezra's working there too. Which makes moving on and forgetting Ezra a lot more complicated...even when Chelsea starts falling for someone new. Doesn't it sound awesome? Plus it's Leila Sales so you know it's going to be hilarious! I can't wait. And in case you were curious about Leila's inspiration....check out this photo of 19 year old Leila dressed in Colonial garb. 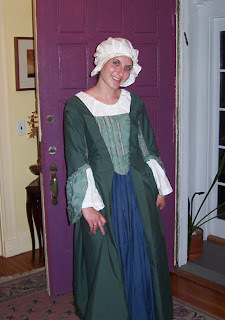 She was a historical interpreter in Boston. Leila, you just got more awesome. I seriously cannot wait to read PAST PERFECT! When I was little, I thought being a historical re-enactor would be the coolest job ever. So I'm pretty sure this novel will be right up my alley. Looking forward to it!